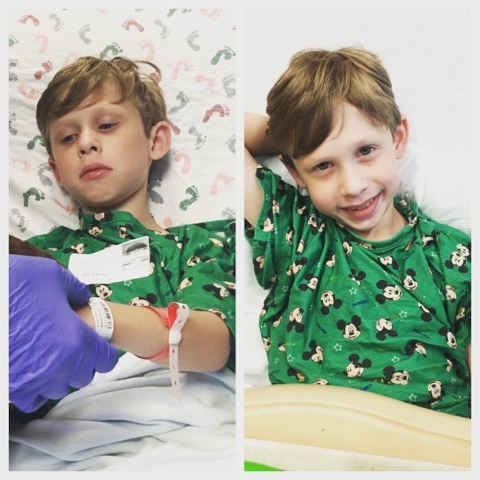 Bennett Brinson Gamel: Fighting Cystic Fibrosis: What makes a good hospital stay? 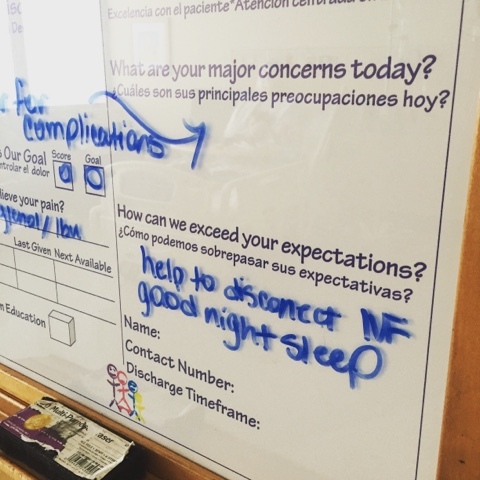 Upon asking myself this question recently, I decided to draw up a list of 10 factors that seem to make a hospitalization for our family feel like it went really well or really not. Most of these things are things that nobody has a lot of control over. Things such as the patient's pain level, how long one stays at the hospital or whether or not the hospitalization is planned are not often in anybody's control. But, at least, knowing these factors can help me understand why sometimes hospitalizations feel like they go better than others. The one thing about being in the hospital is that it tests everything within you as a human. Being in the hospital, whether you are patient or the caregiver, can feel like a full loss of control. * People can interrupt you whenever they please. There's no lock on your hospital door. * People want to talk to you when it's convenient for them, but not necessarily for you. "Oh, it's 6:30AM and you're sleeping? Sorry about that. Anyway..."
* You have to wear lots of monitoring devices until the doctors decide they don't want to monitor you anymore. * You have no way to protect your sleep while in the hospital. Hospitals are noisy and work around the clock. Hospital staff work on their own schedules which may or may not coincide with other staff members or your sleep schedule. * You can't be with your immediate family. Visiting hours, restrictions on children and sleeping arrangements that accommodate one caregiver at a time make it extremely difficult for families who face long hospitalizations and who live out of town. * You eat only what the hospital says you can eat. * You aren't allowed to give yourself medicine. The nurses have to do it for you. * You often have to pay to park your car at the hospital, even though you didn't want to be there in the first place. * You can't leave to go home until the doctors tell you you can or you'll be stuck with the bill, if you do. Insurance won't pay if you don't get permission from the doctors first. While it's true so many factors to a hospitalization cannot be controlled, there are others that can. 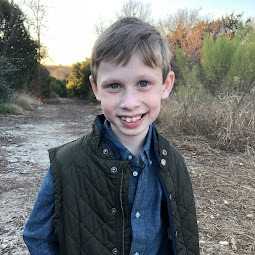 During our recent colonoscopy at Children's Medical Center in Plano, I appreciated that, tucked inside a folder the nurse gave me with several important documents regarding anesthesia and Bennett's procedure, was a little piece of paper and pencil so I could write down any questions I might have for the doctor. 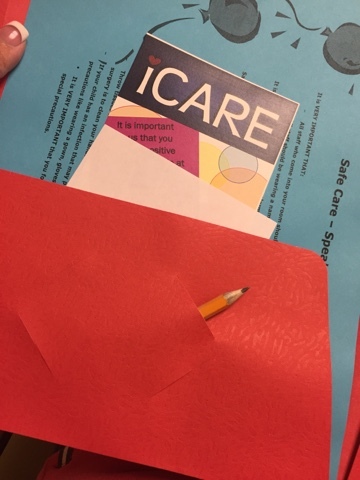 I really loved the extra effort the staff went through to provide a pencil and paper for stressed out parents to use either before meeting with the doctor or during the visit. That extra thoughtfulness meant to me somebody somewhere cared about me in this moment. I really loved this. 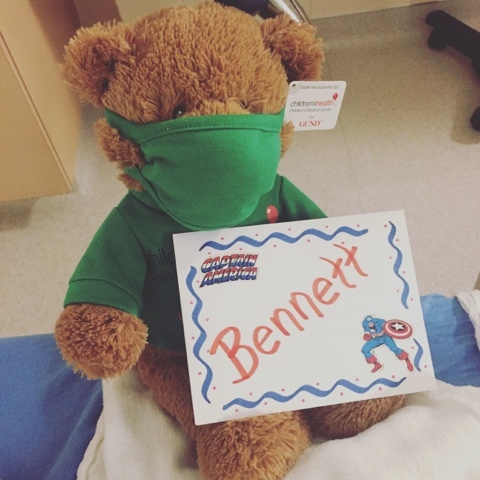 After Bennett's procedure and while he was still in recovery, Bennett was given a teddy bear as a gift from the hospital. This was a fun surprise for him to wake up to. On top of that, the staff created a card for him with stickers and his name on it. Inside was a sweet note signed by his nurses. 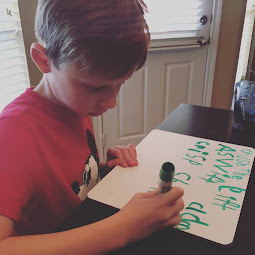 That extra touch and connection to the child has lasting abilities for children with chronic conditions and their parents. 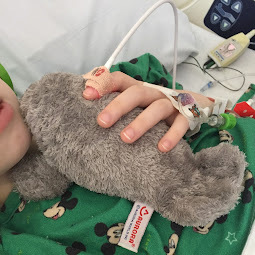 It's easy for a parent to reason: if you took this kind of care in making my child a delightful little card, there's a good chance you took this kind of care of my child during surgery. This idea apparently came from the medical residents themselves. 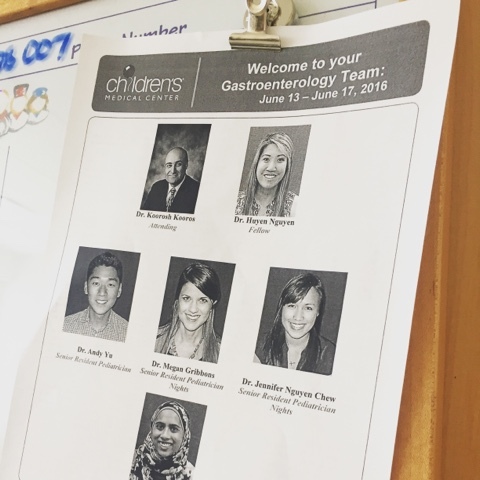 When Bennett was recently admitted to Children's, which is a teaching hospital, we were given a wonderful list of all the residents, medical students and attending doctors that would be caring for us during our stay. It was a very useful tool that both Brian and I appreciated. If I could improve on this idea at all, I would suggest that, under each person's name and picture, be placed a role description of that person's job. Everybody on the list we were given were listed as a doctor. But doctors some are more decision makers more than others. Patients would be well-served to understand the difference between an Attending Doctor versus a Medical Student. But either way, this was an excellent resource and one I hope more hospitals will adopt. 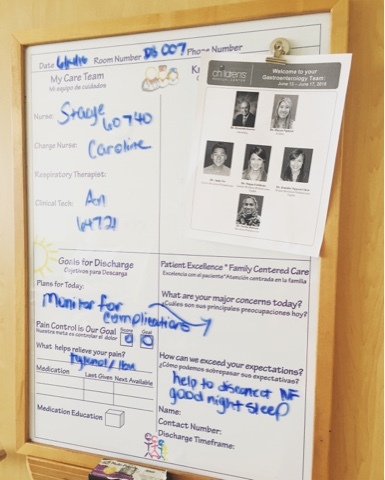 One of the new things in the hospital rooms are white boards that the nurse and patient are directed to fill out together. 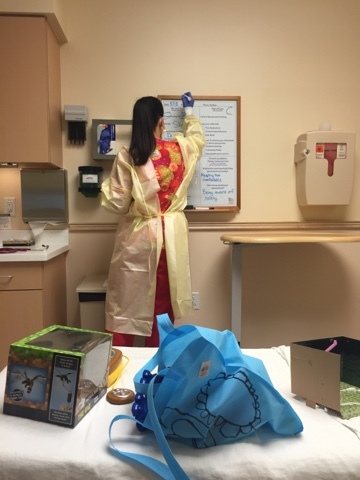 Recently, our two visits to Children's Medical Center we appreciated our nurses who utilized these white boards. The white boards include a lot of useful information for the patient. The question on the board I appreciate most is, "What can we do today to exceed your expectations?" It's a tough question for me to answer because I often don't expect my expectations will even be met, much less exceeded. So, I love nurses are beginning to ask this question. 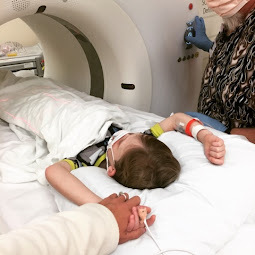 When asked this question during our last hospital stay, Brian and I shared that we hoped Bennett could get off his monitoring devices as early in the day as possible and that we ultimately wanted a good night's rest. The nurse seemed to really identify that those two things were important to us and seemed to make a special effort to meet both of those desires. However, it took only a shift change before the benefits of this white board were lost. Even though our desires were up on the wall for all to see, no one but that first nurse ever seemed to notice. Despite our voiced desire to have a good night's rest, it was the trash lady who came in at 2AM and woke us up that kept our voiced desire from being met. Nonetheless, it was a good effort that I hope continues and spreads to other parts of the hospital system. Speaking of hospitals, we have a date for our next one. Two weeks. June 30th. Bennett has been doing well since his procedure so we are prepared to do it again. I'm praying this next one will be equally as peaceful as the last one...sans the 2am trash lady!